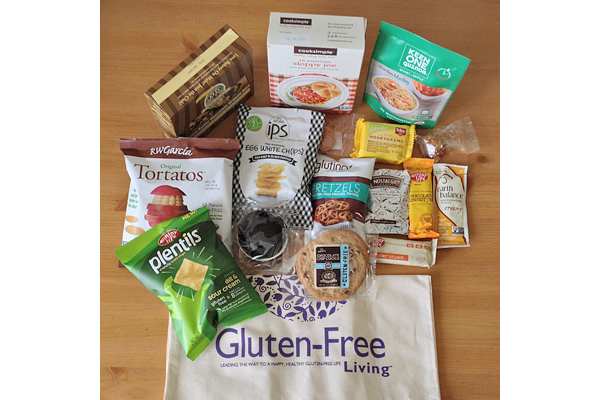 Last weekend’s Gluten-Free Living Conference was a whirlwind of insightful speakers, sensational celiac and gluten-free bloggers, and a mind-boggling number of gluten-free vendors and snacks. Hearing Dr. Alessio Fasano speak about recent celiac research and meeting Amie, Amy, Andrea, Angela, Chrissy, Johnna, Jules, Linda, Michael, Penny, Sarah, Scott, and Shirley made for a seriously incredible three days. The sunshine, palm trees, and Mickey Mouse ears didn’t hurt, either. This was Orlando, after all! Undoubtedly, the tastiest part of the weekend was the expo hall. Gluten-Free Living brought in an impressive array of new and familiar gluten-free vendors, including Brazi Bites, Kinnikinnick, The Piping Gourmets, Schär, Taste Guru, and Udi’s Gluten Free. From cookies to pretzels to soup, below are some of the best gluten-free travel-ready snacks and meals I found at the expo. Nostalgic Cookies are made with exactly the kind of ingredients I want to eat: almond flour, coconut oil, brown rice flour, and just the right amount of sugar to make them the perfect sweet treat. 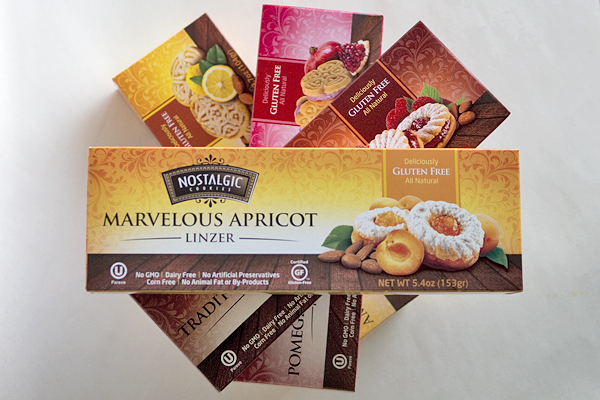 A huge fan of fruit-filled sweets, I loved the buttery-tasting, jam-filled Marvelous Apricot Linzer and Traditional Raspberry Linzer. The Pomegranate Hibiscus Pleasures and Amaretto Limoncello Glee have a nice, light, fruity crunch and are lovely, delicate cookies. The best part? 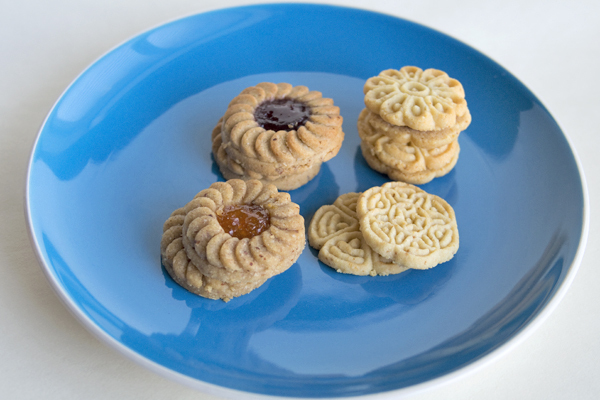 All Nostalgic Cookies are packaged by serving size, so you can easily toss a single cookie (or two!) into your travel bag. Chunkie Dunkies strike a perfect balance between healthy and indulgent. 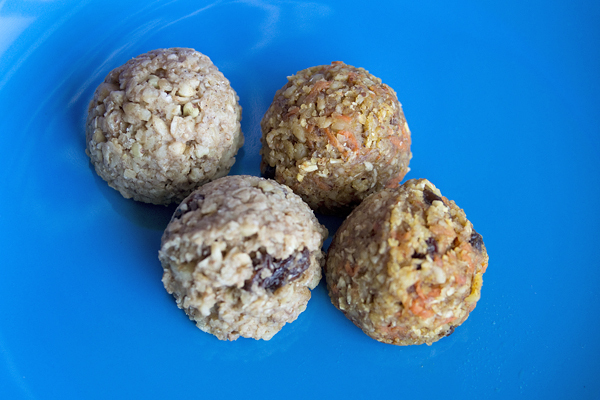 These raw, vegan treats are packed with certified gluten-free oats, sprouted buckwheat groats, and coconut oil. Both the Oatmeal Raisin Walnut, slightly sweetened with cinnamon and raisins, and the Carrot Cake, made with carrots, coconut, and a touch of maple syrup, were delicious and filling. 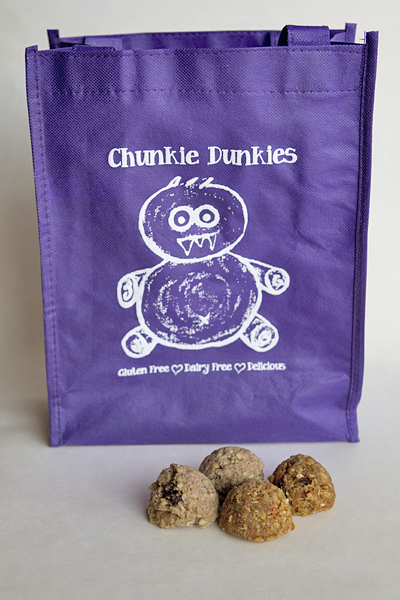 Chunkie Dunkies are sold in small packages, just the right size to share with your gluten-free travel partner! 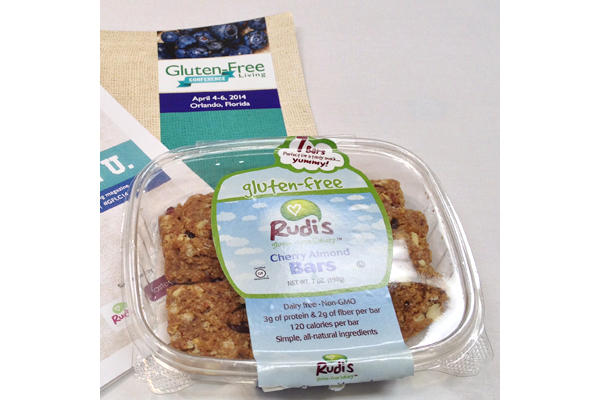 Rudi’s Cherry Almond Bars are also packed with nuts, nut butter, and dried fruits (cherries and cranberries). Though not raw, these little bars are both tasty and addictive and would be great fuel for a hike, either in the great outdoors or (in my case) through a city. Helwa Wafers are pure indulgence. Made with teff flour and Belgian dark chocolate, these taste just like Kit-Kats. 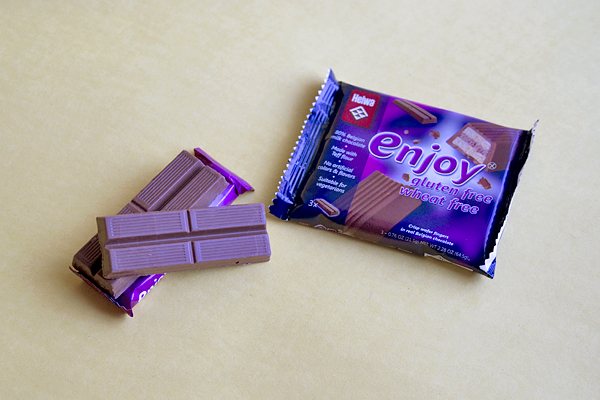 Unlike Kit-Kats, Helwa Wafers are gluten-free and packaged in pairs. Keep one in your travel bag, and you’ve got a sweet emergency covered. Glutino pretzels may not be new on the market, but they were new to me. 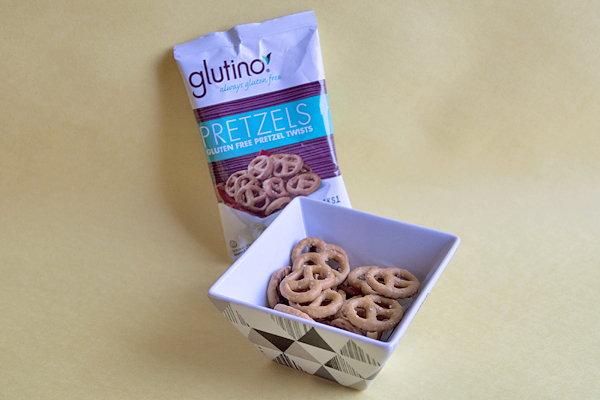 Better than any wheaty pretzel I can remember, these gluten-free pretzels cover all the bases: buttery, crunchy, and a satisfyingly salty snack. These will go right into my regular travel snack rotation. A protein-filled snack, Plentils (see image at top) are made with lentils and very lightly fried for an intense crunch. They’re made in four equally delicious savory flavors—Dill & Sour Cream, Pizza, Garlic & Sour Cream, and Sea Salt—and available in individual serving size bags. These would be great for plane trips, where gluten-free eaters know the chances are slim that they’ll be able to partake in the airline-supplied salty snacks. Snacks are all well and good (okay, they’re amazing!) but sometimes you need a hot meal when you’re traveling. 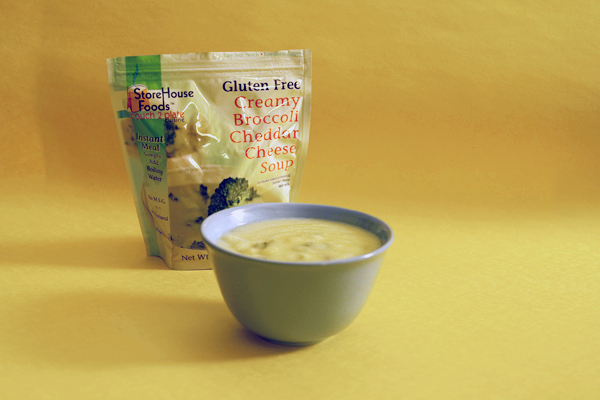 StoreHouse Foods Broccoli Cheddar Soup is best gluten-free instant soup I’ve found, and it packs easily into a carry-on bag. Just add hot water directly into the pouch, stir vigorously, let sit for 10 minutes, and eat. Truly “pouch to plate,” you don’t even need a bowl to enjoy this hot, hearty, rich soup. Disclosure: These products were provided to me as samples. All opinions expressed are my own.